Sometimes the subject of a blog for Camp Echo Lake puzzles me as I wait for inspiration. This one came to me in a flash. I was breaking bread with David Prager, a resident of London for about 8 years if I recall correctly. As it happens I journey to London twice a year to see the best in theatre. I had wanted to see David for years and finally I made contact. David and his older brother Gregory are still in touch with all their camp buddies of 35 years ago! When you live in a cabin for almost 8 weeks with a group of guys you become brothers. Same is true of girls who really know how to bond. The Prager family, headed by Alice and Mel, residents of W Orange, N.J selected Echo Lake as their children’s summer home nearly 40 years ago. Greg, #1 son, and now a resident of Lausanne, Switzerland preceded younger brother David to Warrensburg. During their many years both boys went through camper ranks, then as CITS (before we changed the name of that group to LITS) then onto staff. Many years ago one of our clients decided to host an art auction at his gallery in Greenwich, Ct. It was to benefit The Echo Lake Idea, our charity that underwrote the cost of having 50 inner-city campers brought to Echo Lake at the end of the summer for a week. The IDEA, as we called it, existed for over 45 years, supported by alums, camp families and volunteer staff. The concept actually spawned Project Morry in memory of my late husband Morry Stein. Project Morry is now supported by our current and alumni families, campers and close to 30 other day and resident camps. We needed someone to cater the event. Alice Prager, caterer, immediately volunteered, supported by her husband Mel and her camp director, me. The event was a smashing success…..tasty, social, everyone went home with a lovely print or two and The IDEA was very financially successful. What is my point? My point is that the Pragers fell in love and in line with the values that are the bedrock of the Echo Lake experience. They trusted us to set the stage and reinforce every level of their children’s growth each summer. All their sons friends were warm, respectful, and fun people. They were also the products of good parents who trusted us to reinforce parameters in terms of behavior and fair play and imaginative and well instructed activities. These are our Echo Lake moms and dads, folks who very carefully seek a culture at camp. They are putting their beloved children into our hands, hands that treasure these boys and girls, commit to love them, teach them, enjoy them and laugh like crazy with them. 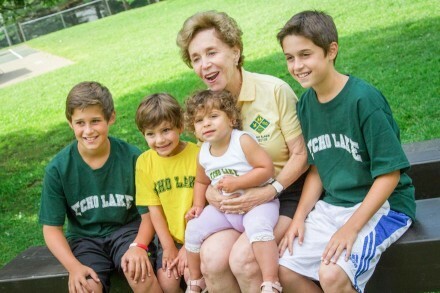 It is a grand family, people, and Echo Lake is that other family. We are in a loving and joyful alliance with you. Everyone, I said everyone, comes out waaaay AHEAD! These are lifetime imprints on the hearts and souls of your boys and girls who, by the way, are on loan to you moms and dad for ten months. The other two months they belong to us!